Rosa Munson-Blatt '21 is expecting to major in Feminism, Gender, and Sexuality Studies with a writing certificate. She wants to explore how startups and the entrepreneurial paradigm can be a conducive and empowering environment for women, including the upcoming generation of leaders that are young girls. Further, she is compelled with the amalgamation of social justice and tech companies and how they can be utilized catalysts for activism. We visited the headquarters of Asana, an application that enables companies to communicate and track member’s work in a streamlined, effective way. 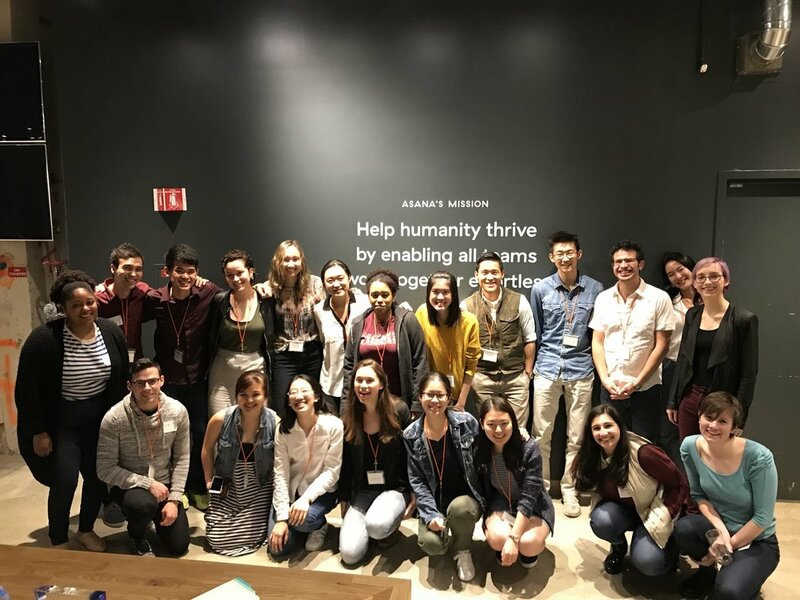 First, we took a tour of their beautiful facility which was located in downtown San Francisco, equipped with napping rooms, panoramic view of the city, healthy, zero waste food services among many other impressive facets. (Interestingly, the theme of their conference room names - kiki, standing ovation, rock, paper, scissors - was "things that people can do in a group.) The guides included Joanna Miller, who leads Learning and Development for the People’s Operation Team. We then had dinner with several Asana employees and Wesleyan alumni, including those we’ve met already Alex, Pi, and Mika, and new alums Max Gunawan, Adam Smiley Poswolsky, Erik Islo, and Nina Chen. It was really interesting to hear about Adam’s current work as his own boss and the freedom it allows him. We were fortunate enough to have a chance to look through his book “The Quarter-Life Breakthrough” which was recently translated into Chinese, a version many team members were also able to enjoy. (Rosa: As an FGSS major, I was particularly enthused with his initiative for gender inclusivity regarding conference speakers. )This sparked a really fruitful talk on diversity and empowerment of minorities in Silicon Valley with Adam, Joanna, Pi, and Alex. It highlighted the pertinence for projects aiding gender parity and inclusivity in tech/startup environments, something I would be interested in pursuing post-grad. Many of the team members that talked with alum Nina found her trajectory really compelling: while she always knew she was interested Econ, she did not share her peer’s interest for careers in investment banking, instead, she sought out nonprofit work during her senior year. Through a Wesleyan network, she found a job serving as a financial strategist for Yale University. Eventually, she felt she was not being challenged enough impelling her to move out to Silicon Valley, where she discovered her passion for product management. She then attended Wharton Business School and now works at Amazon as a senior product manager, where she has been excited to find challenging work at. Max shared a lot about his journey from initially wanting to be an investment banker as a college frosh to developing a passion for architecture to his current mission of “make life better by making simple, beautiful and functional products” (slogan of Lumio which is Max’s company). Now as his own boss, Max told us about the lessons that he learned from the entire process of designing, manufacturing and selling his product. From a manufacturer in China, he learned that he shouldn’t control all the (little) details and instead “decide on the end goal and let it flow like a river”. From his various mentors, he learned how to learn as much as possible from frameworks already developed by other people but still have the confidence to follow his own gut. Max opened up about still having the long-term goal of having positively impacting Indonesia (his home country) in his own way. (Frederick: As a fellow Freeman scholar, I share the sentiment of impacting my home country and am encouraged by him.) I am looking forward to seeing the new auditory-based product that he is currently designing. Meeting Erik again gave me an opportunity to thank him for a few of the thoughts he gave for me to consider after last year's Kai trip. (Frederick: Last year's team and I had an informal dinner with Erik at the Airbnb we were staying in.) Our conversation challenged my opinions attributing people's success mostly to their own merit and hard work. Erik helped me recognize the advantages that I grew up with - supportive parents, great educational opportunity and capacity to learn - and increased my sensitivity to other people's lack of similar advantages. Those thoughts shaped the classes that I am taking and the projects that I am involved in for my sophomore year. I am happy that I had the opportunity to catch up with him about the changes in his and my life in the past year. Our team wasn't expecting such a big crowd at the dinner but we were all happily surprised. Asana employees made us feel at home, conveyed their day-to-day experiences working and gave insight on working in Silicon Valley. All the Wes alums provided the students with great and relatable advice on life after a liberal arts education and fun conversations about changes in campus and culture over the years. A big thank you to Joanna and Smiley who made this event possible! Thank you to all the Wes alums and Asana employees were at the dinner with us! It was the best way we could have spent our last night in Silicon Valley.